Q: Is there a dog treat recipe for a dog with a calcium oxalate stone issue? Oxalates carry a poor prognosis. That is because once the stones are formed, it is hard to dissolve them. If they are large enough to cause urinary tract blockage, surgery may be indicated to remove them. Acidic urine promotes their formation. We do not have a great idea for homemade dog treats to offer because wheat, which is the base for dog biscuits and dog cakes, is a urine acidifying agent. There may be lesser known flours that are nor acidifying, but we are still looking into it and don't have a definitive answer to offer. The best we can do right now is to tell you about certain foods considered to promote alkalinity in the urine. You should always check with your veterinarian first before feeding any of these to your dog. There may be other concerns that only your vet would know. Keep in mind that if a dog is genetically pre-disposed to forming oxalate stones, dietary modifications may not make any difference. Certain fruits are known to be high in oxalates like blueberries, and cranberries are considered to be a moderate oxalate producer so amounts should be limited. White rice and wild rice are low in oxalates and can be eaten without worry. Overall, grains and animal proteins are considered to be urine acidifying. You may have a vet who will tell you that due to the dog's genetics, it won't matter what you do so it will be OK if he gets certain foods in small amounts. But to be on the safe side, wheat based dog biscuits and dog cakes should be limited. Chicken breast (white meat) is considered alkaline by some sources and all chicken is considered acidifying by others. Eggs are considered alkaline. Yogurt is considered alkaline by some sources. We say "possible" because you should definitely check with your veterinarian first. If OK, a nice treat would be chicken jerky dog treats made with chicken breast. 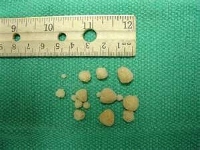 If you have a question, please submit using the form here: Dog Bladder Stones.